Disrupt Trading Review - Scam Exposed! Disrupt Trading software found at disrupttrading.com promises to make you $12,875.96 by today, but can they be trusted? We recommend that you stay as far as possible, because Disrupt Trading is a scam. We’ve collected the necessary evidence to expose the scam, so make sure you read the full Disrupt Trading review before dumping money into a trap! Isn’t Disrupt Trading scam promising a bit too much? Disrupt Trading software was first brought to our attention by a couple of readers who complained about losing money with the it. Realizing this may very well be another binary trading software scam, we decided to look into it and warn other readers who are still considering to sign up for it. Greg Hardman, the alleged owner of Disrupt Trading, claims that he can make you over $10,000 within the day of signing up for his miracle software. The catch? You have to deposit a minimum of $250 into your trading account, despite Greg’s promise that you can get started for completely free. Depositing the $250 will be your biggest mistake, because it is how the scam makes money off you. We’ll explain how the scam works at the later part of this review, but first let’s talk about binary options to make sure everyone is on the same page. Binary options has only been introduced for a few years, but it is highly popular due to its simplicity compared to other trading instruments, such as stocks and Forex market. Even though it’s a form of trading, binary options is in fact more similar to gambling. Binary options traders rely on trading hunch, in which they guess if an asset’s price will rise or fall after a short period of time, usually between 30 seconds to a few minutes. Let’s say I predict that the price of GOOGLE stock will fall 1 minute later, and I bet $50 on a binary options contract. If I’m right, I win a certain percentage of what I bet, usually between 60% to 80%. But if I’m wrong, I lose the entire $50 that I bet. As you can see, the whole process is no different from traditional gambling. Market movements in such a short period of time is impossible to predict, let alone getting it right consistently. Even if you manage a 50% win rate, you’ll still lose money due to the uneven winning vs losing payout of binary options. The system is designed to work against you while favoring the brokers. Your loss is their gain. What Disrupt Trading software does is that it trades binary options on your behalf using a set of programmed algorithm. Removing emotions from trading may be a good thing, but when it comes to such a short trading time-frame, no algorithm can predict the market movement and get it right consistently. If you were convinced by Disrupt Trading’s presentation, let’s take a look at some evidence to debunk the false promises made by the scammers right within their sales materials. Social testimonials can be extremely deceiving. If you scroll down from the sales video, you would have noticed the row of alleged current users of Disrupt Trading software. Every single one of them gives a raving review for the software, and Thomas Roberts (to the extreme right) even claims that he is making $14,000 a day without knowing how it works. Depending on where you come from, you’ll see your country’s flag on top of the profiles. Our IP address was in United States when we reviewed the scam, hence the U.S. flags. Pay attention to the flags, member pictures and their names. 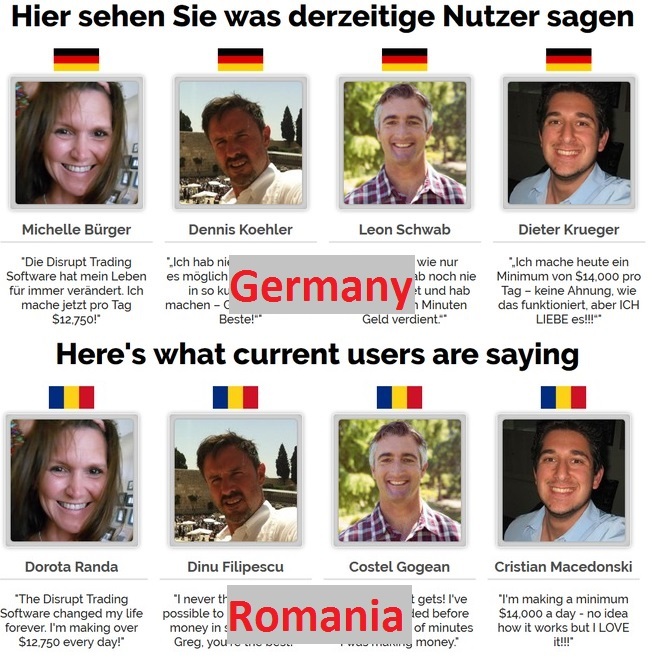 However, when we switched our IP address to that of Germany and Romania using a VPN service, we noticed something interesting. Depending on where you are from, you’ll see different names under the same profile pictures. This easily proved that the profiles aren’t real at all. These testimonials are crafted to boost the credibility of the software, and it is nothing more than a tool to confuse its victims. Vast majority of their victims wouldn’t realize this, and it’s the small details like these that give away the scam. The scammers just don’t know when to stop. Similarly, if you have provided your name and email address to access the members area, you will come across a few more fake profiles that promote the scam. These profiles are there for a reason – notice how they are giving you a glimpse of what to expect in just 10 days? You are led to believe you can make over $100,000 in just short 10 days. They are trying to feed your imaginations, so you will take the final steps and pay your hard-earned money to them. These pictures are actually stolen from all over the internet, and you can verify for yourself through the links below if you want. Fake member 1, Lewis Shanks – original picture found at Otago Daily News. The picture belongs to Richard Roberts, CEO of Dunedin Airport. Fake member 2, Jeffrey Bryant – original picture found at dentalcosmetics. The picture belongs to Dr. Jack Ringer, a dentist. Fake member 3, Darlene Radcliffe – original picture found at LinkedIn. The picture belongs to Tanja Pas, which have since been removed from LinkedIn. How Disrupt Trading Scam Makes Money Off You? If you decide to use Disrupt Trading software, you will be required to fill up the registration form through their website. It’s actually a sign-up form to open up a new binary broker account which Disrupt Trading scam is affiliated to. Every time a referred member makes a deposit with the broker, the scammers behind Disrupt Trading software earn a sum of referral fees from the broker. Once you activate the auto-trading feature of the software, you will lose your fund in quick successions. Your losses become the profits of the broker. In the end, the scammers and the brokers end up as the winners, and you will be the only loser in this trap. YES, DISRUPT TRADING SOFTWARE IS A SCAM. We strongly advise you to stay away from the scam if you don’t want to lose your hard-earned money.